The name of this corporation shall be VACATIONLAND DOG CLUB, INC. and its location shall be in the Greater Portland area. 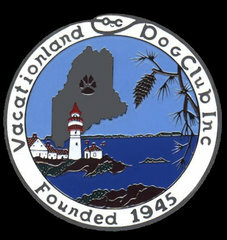 The corporate seal of this organization shall be circular, bearing the words VACATIONLAND DOG CLUB, INC., 1945. A. To encourage and promote the raising and general care of purebred dogs. B. To promote harmony, fair play, and good sportsmanship in the best interests of purebred dogs. C. To encourage the novice owner and breeder in his approach to the raising and general care and training of purebred dogs. D. To assist all members in the showing, breeding, and general care and training of their dogs. E. To assist the general public to understand dogs of all origins and learn to better care for and enjoy them, through educational and instructional programs, projects, and exhibitions. F. To encourage and hold dog shows, matches, tests, exhibitions, obedience trials (and field trials and performance events), all under the rules and regulations of the AMERICAN KENNEL CLUB. G. To provide and maintain suitable facilities as may from time to time be desired and necessary in furtherance of the foregoing, such that club members may be afforded the usual privileges, advantages, conveniences and accommodations of a dog club. Notwithstanding any other provisions of this certificate, the corporation shall not conduct or carry on any activities not permitted to be conducted or carried on by a corporation exempt from Federal Income Taxation under Section 501(c)7 of the United States Internal Revenue Code and its regulations as they now exist or as they may be hereafter amended or by a corporation with capital stock organized under Title 13, Chapter 61 of the 1964 Revised Statutes of the State of Maine and amendments thereof. To receive membership fees, dues and contributions and to administer and expend the same in support of the operation of the club. To accept, acquire, receive, take and hold by bequest, devise, grant, gift, purchase, exchange, lease, transfer, judicial order or decree, or otherwise, such as real and personal property, whatever its kind, nature or description, as the purposes of the corporation may permit, or as the limits of the law may prescribe. To sell, exchange, convey, mortgage, lease, transfer, or otherwise dispose of, any such real and personal property, as the objects and purposes of the corporation may require or permit, subject to such limitations as may be prescribed by law. To borrow money for its corporate purposes, and, in pursuance thereof from time to time, to make, accept, endorse, execute and issue bonds, debentures, promissory notes, bills of exchange, and other obligations of the corporation for monies borrowed or in payment for property acquired or for any of the other purposes of the corporation, and to secure the payment of any such obligations by mortgage, pledge, deed, indenture, agreement, and other instrument of trust, or by other lien upon, assignment of, or agreement in regard to all or any part of the property, rights, or privileges of the corporation wherever situated, whether now owned or hereafter to be acquired. To enter into, make, perform, and carry out contracts of every sort and kind for any of the objects or purposes of the corporation, with any person, firm, association or corporation, municipality, body politic, country, territory, state, or government, so far as, and to the extent that the same may be done and performed by a corporation organized under the hereinbefore mentioned title and chapter of the Maine Revised Statues. In general, and subject to such limitations and conditions as are or may be prescribed by law, to exercise such other powers so conferred by law upon a corporation organized for the purposes hereinbefore set forth, or necessary or incidental to the powers so conferred, or conducive to the attainment of the purposes of the corporation, subject to the further limitation and condition that, notwithstanding any other exercised as are in furtherance of the tax-exempt purposes of the corporation and as may be exercised by an organization exempt from Federal Income Taxation under Section 501(c)7 of the United States Internal Revenue Code and its Regulations as they now exist or as they may hereafter be amended.